Training your cat to use a cat scratching post is a necessary and important step when you are dealing with the question of "How to stop a cat from scratching furniture?" First, it is important to learn how to choose the best cat scratching post. Getting your cat to use her scratching post is much easier when you have taken the time to choose one for which she will automatically have a natural affinity. Once you've done that, employ the following tips to train your cat to use a scratching post and stop scratching your furniture or carpeting. A critical step in ensuring that your cat uses her new scratching posts is making sure that you choose the best areas in the house to place them. The best scratching post placement is done using knowledge of normal cat scratching behaviors. Though we humans may have preferences for where we'd like the cat scratching posts to be in our home, usually in corners and out-of-the-way places, these aren't always the best spots in the eyes of our feline friends. When we consider the issue from their point of view, it's easy to understand why. One fact that we can use when choosing cat scratching post placement is that cats scratch to communicate to other cats about their territory. The visual scratch marks on objects and the scents that are deposited from glands in the cat's paws are both messages that are easily read by other cats. With this in mind, it's obvious that your cat would not find a corner or inconspicuous area to be a suitable place to leave such messages. She prefers a flashing billboard in the form of a tall, sturdy scratching post in a prominent area of the home. Choose high-traffic areas and unhidden spaces in rooms to satisfy this evolutionary feline urge. But don't despair. Once your cat is reliably using her cat scratching post, it can usually be moved (slowly, over a period of weeks) to a spot that fits better with your home décor plan. Another reason that cats scratch is to stretch the muscles in their bodies, especially the shoulders, toes, and feet. They love to do this when they first wake up, making the area around their favorite sleeping spots excellent spots to place scratching posts, as well. If your cat is scratching at a certain area of carpet, this may also be a good spot to put your cat scratching post or scratching pad. You already know she likes that area, and it may help her understand that you want her to use the scratching post or pad instead of the carpeting. If your cat is scratching at the arms of your couch or the sides of other furniture, she can often be deterred when you place a heavy blanket, tucked in well so that she can't get under it, around the area. Then, place her cat scratching post directly in front of the object she was previously scratching. Once she has left the furniture alone and used the post reliably for a week or two, you can begin moving the scratching post to your preferred spot, at the rate of an inch or so a day. A final note on cat scratching post placement: Providing cats with multiple scratching posts in different areas of your home increases the likelihood that your furniture and carpeting will be left alone. If your cat is already using an inappropriate object or place to scratch, examine it to gain valuable information. Are the scratch marks high or low, on a vertical or horizontal surface, in a corner or under a bed? You can use this data to help you choose the type and placement of scratching posts and pads. Cats like to scratch on vertical surfaces, horizontal surfaces, and angled surfaces. Sometimes they enjoy finding places to scratch in special areas such as under the bed or in the closet. If your cat doesn't immediately use her new scratching post or shows only mild interest in it, don't worry. Sometimes they need a little more coaxing in order to discover that you've provided them with the best scratching surface they could hope for. Here are a few tips for introducing your cat to her new scratching post and training her to use it. Catnip: Young kittens and some cats are not interested in catnip but many cats go crazy for it. If you have one of these cats, sprinkle some loose-leaf catnip on the base and top of the cat scratching post. When your cat licks it up, she'll usually start kneading her paws. This will allow her to discover that it is a great scratching surface and she'll remember that and use it to its fullest later. Play: You can help your cat learn that her new scratching post is awesome by playing with her around and on it. A great way to accomplish this is with a wand type cat toy. With this, you can encourage your cat to reach up and place her paws on the scratching post as she's reaching and diving for the toy. 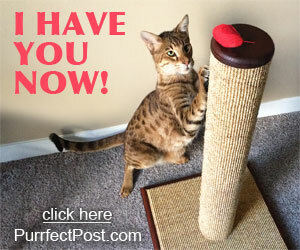 You can also try placing your cat's favorite toy on top of the post to interest her in climbing up to get it. In short order, she'll find that she loves scratching on the post, too. Try laying the scratching post on its side. When you are working with a cat that has never used a scratching post, it may help to first place the post on its side. Use the above methods of sprinkling catnip and playing around and on the post, especially with wand toys. Once your cat is using the post in this position reliably for a few days, you can stand it up and provide even more enjoyment. The more cats you have, the more scratching posts you'll need. Encourage your cats to play with each other on and near the scratching posts by tossing small toys and balls around them. 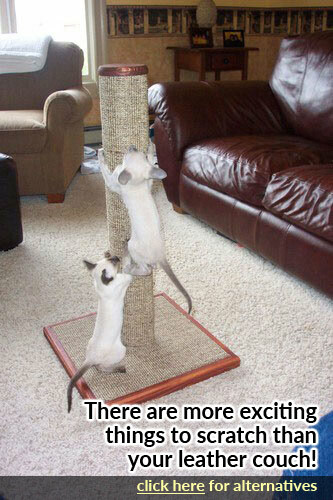 Treats: Some cats love treats so be sure to have a few in your pocket while you're introducing the scratching post. Initially, you can give a treat if your cat sniffs and investigates the post. As she becomes more familiar with it, give a treat when she places her paws on it, working up to when she scratches it. You can also try putting some treats on top of the post. This will encourage her to climb up the post to retrieve the treats. Treats will make the scratching post a very positive experience for your cat. Together with your efforts to increase your cat's interest in her scratching posts, you can use a product called Feliway, a spray that mimics the feline facial pheromones that make cats feel good, a few times a day on any household object that your cat is scratching. Using both methods simultaneously, your cat will not only understand that you want her to use the post but that you don't want her to use the furniture. One thing that usually does NOT work when trying to introduce a cat to a new scratching post is to grab her paws and place them on the post. Cats are notorious for having their own minds and liking things to be their own idea. Manhandling their paws is usually a no-no in the eyes of most cats and will likely result in avoidance of the scratching post. An exception to this might be a very young kitten. 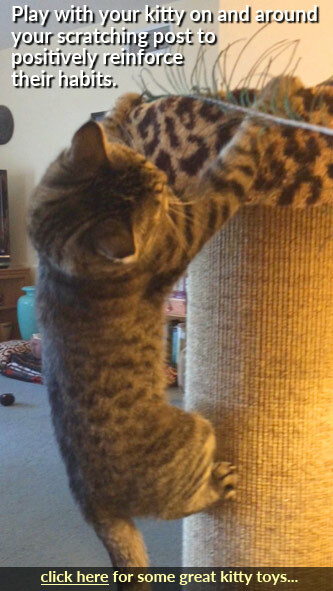 They often can be shown how to use a scratching post in this manner, especially if you don't have an older cat in the home to demonstrate. Play, as described above, also tends to work great with kittens. A brief note on negative training methods: There are lots of approaches to cat training that seek to associate negative consequences with an unwanted feline behavior, causing them to avoid it in the future. These include squirting your cat in the face with water, making a loud noise with coins in a can, using mousetraps to scare or injure a cat, yelling, hitting, and any other similar strategies. These negative reinforcement techniques usually do not work with cats and, worse, they may completely backfire or cause injury. Many cats become stressed by such occurrences and, when that happens, they will react with behaviors that most humans won't find acceptable. They may urinate or defecate outside of the litterbox, on carpeting, or on personal items. They may scratch more at other objects in the home. In the worst case, they may become withdrawn and hide or refuse to eat. Focus on positively reinforcing the behavior you want to see from your cat (using her scratching post) rather than negatively reinforcing the behavior you don't want. If you have followed all of the steps above for training your cat to use her new scratching post and she just doesn't seem interested in it, try moving it to another area before you give up. A nice spot in front of a window is often a good idea and, if there are birds or other wildlife around for your cat to spy on, the excitement often leads to a scratching session. With a little bit of thought, time, and praise, your cat will be ignoring your furniture and carpeting in favor of her new scratching posts all the time.